I had hoped to show you some weaving progress by now, but I can't. And this time I can't blame it on the cat! The problem is the warp itself, or rather, what the warp is doing. 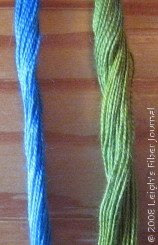 I'm using UKI 20/2s mercerized cottons, which I ordered from WEBS. I've never used this as warp before, in fact I ordered it especially for this workshop. .... and while threading the heddles. Before wishing all of my American readers a Happy Thanksgiving, I would like to share something that I am thankful for. If you've been following Rascal's medical saga, you'll be interested as well. You can check out his news on his blog. Thats weird that it would do that,good luck getting it on. Why aren't you weighting them, oh Master of the Jucie Jugs? Thank you Jewel, the same to you! Oh, Marie, I am! But as soon as the weights come off after I advance the warp, it twists again. Is that the reed the one on the left of the second picture? Hummm a warp with a mind of its own. Good luck! Not a whole lot more frustrating than being excited about weaving a warp that has a mind of its own. So much so that it doesn't even want to get on the loom. Have you tried asking nicely? How maddening. I hope they start behaving for you soon. Good news about Rascal. I know the relief that you must be felling. We've had our share of veterinary medical issues around here. Well, Leigh, what a pain. It's almost as if a twist was "set" into the fibers on the cone. Normally I really enjoy the process of dressing my loom, but a (no pun intended) snag like the one you're dealing with would sure take the pleasure out of it. Have a lovely Thanksgiving. And thank *you* for being such a great online weaving pal and inspiration. PS -- and blessings to Rascal. And I vote "yes" on the treats! It's great to get a heads-up on this yarn! 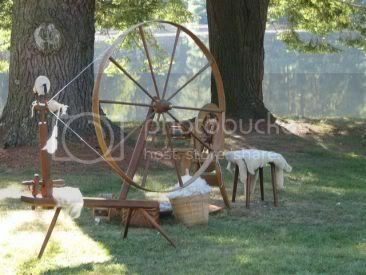 I had the same problem with a knitting yarn warp on my rigid heddle loom recently. Untwist and tease all the way, which fortunately in my case wasn't very far. Best of luck. I am really bad at the physics of spinning but to me it looks like the yarn twists to the left, which means it has been overplied. I wonder if the yarn was sett so that it would not twist (one can do this), but as soon as it hit the water, the twist was activated. In other words, I think you've got some bad yarn and I would complain. Maybe you could figure out a way to make it work to your advantage.. .(you know, a bit like how K. Alexander uses the energized singles in her work?) or, when life gives you twisted yarn make lemonaide... or something like that? What a thing to give thanks for. Good job on Rascal and phew. There's always one warp, isn't there? Knowing you, I'm sure this will succumb to your talents in no time! And from all of us - have a Happy Thanksgiving! Happy Thanksgiving to you and "yours" - not much blogging time for me as I must finish all the caps that I spun all the yarn for last month. I'm getting there - 4 down and only 4 left, I think. I was so glad to read Rascal's exciting news. You must be so relieved :-) Hugs & purrs all around. T.
Kathy, thank you for your comment! Your idea sounds excellent and I will definitely try this with the rest of those cones. I've actually got this one on and ready to weave (photos tomorrow), but it just took too many hours to get this warp warped. Peg, you are probably right and I do need to let WEBS know. This is the first yarn I've had from them that I haven't been happy with. Laritza, that's my Glimakra raddle on the left in the 2nd pic! Thank you to everyone for your good wishes concerning Rascal. It's such a relief to know that he is still in remission. I feel you pain as I had the same thing happen to me, with some Harriville from Halcyon. 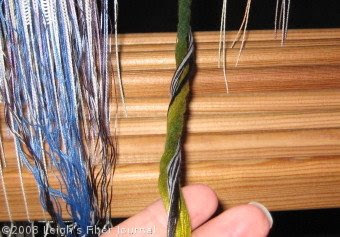 I'm a newbie weaver, so it just about brought me to tears! I talked to the experts at by local yarn store and they said this happens when tight cones sit on the warehouse shelf for long periods before they are sold. The good news is: once I got into the cone, using it for a second project, the problem went away. Holly, that's encouraging information, thank you for taking the time to comment on this! I'll report back on this next time I use this as warp. I warp front to back, and now you have found out why. reed-heddles-beam. It helps. 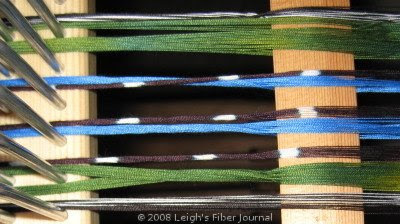 I weave a lot of painted warps, and would be frustrated trying to warp b2f. Sara, you've definitely given me something to think about. I will have to see if this makes a difference. Actually, my first introduction to warp painting was your video. This is the first time I've actually tried it however!